- Celtic march, with a hint of rock! Then the Lord will go out and fight against those nations, as He fights in the day of battle. On that day His feet will stand on the Mount of Olives, east of Jerusalem, and the Mount of Olives will be split in two from east to west, forming a great valley, with half of the mountain moving north and half moving south. The Lord will be king over the whole earth. On that day there will be one Lord, and His Name the only name. But Jerusalem will be raised up and remain in its place ... It will be inhabited; never again will it be destroyed. Jerusalem will be secure. I dare to assume that as these nations arrive in Jerusalem, they will each contribute their own particular culture, music and dance in their worship. The Celtic nations also will arrive with their own wild brands of celebration! Let us prepare ourselves for that day! Raymond McCullough and his wife, Gerry, direct Kingdom Come Trust, in Northern Ireland. From 1990-96 they edited and published the Irish Christian magazine, Bread. 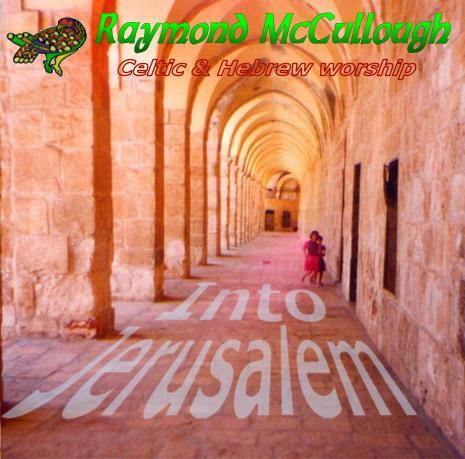 For eight years after that they led a cell-based fellowship in the greater Belfast area and during this time Raymond began using his own Celtic and Hebrew style songs in worship - also leading worship at weekend retreats and for larger groups in churches, leisure centres, etc. The 12 songs offered here range from lively Scottish and bluegrass tunes; through strong Celtic hymns, to more contemplative Irish & Jewish worship - with an Irish jig thrown in for good measure! May they encourage you in praise and adoration of our Creator and Lord.